When the Air Force cancelled the B-52 standoff jammer program in late 2005, it threw the future of the U.S. military’s Airborne Electronic Attack capabilities into disarray. The Air Force was supposed to assume leadership of the U.S. military’s electronic attack expeditionary mission from the Navy in 2012. But the Air Force has been out of the electronic warfare business since it retired the EF-111A in 1996, prompting the question whether the B-52 SOJ cancellation meant the Air Force intends to ditch that mission altogether. The Air Force insists that it, as well as the office of the secretary of defense, are studying alternatives to the B-52 SOJ, but opinions differ whether this signals a real intention to resume a role in electronic warfare. The Navy’s standoff jamming capabilities are lead by the EA-6B Prowlers, which the Navy is now fielding with an upgraded ICAP III jamming suite. The ICAP III will also be initially provided on future electronic attack assets such as the EA-18 Growler, which the Navy plans to introduce in 2009. But the Navy’s electronic warfare capabilities are not designed to meet future national electronic warfare needs. Rather, the Navy, in its procurement planning, and the Congress, in its funding mechanisms, both currently assume that the Air Force will be shouldering its Airborne Electronic Attack role. It is feared that the cancellation of the B-52 SOJ, motivated largely by budgetary constraints, will leave the military with a dearth of electronic attack assets with which to counter the integrated air defense systems (IADS) of future adversaries. The vacuum left by the cancellation of the Air Force’s B-52 SOJ must be filled, therefore, either with an alternate Air Force program, or enhanced future Navy capabilities. The B-52 standoff jammer was part of the Air Force’s Family of Systems and was designed to meet the challenge of evolving IADS of future adversaries such as Iran and China. IADS capabilities have become more mobile and more difficult to overwhelm with current jamming capabilities. Stand-off jamming is designed to disrupt IADS from outside their range, thereby reducing the risk to warfighters’ lives. The B-52 SOJ was to deny the enemy long-range radar capability, which, together with the EC-130 Compass Call that would target enemy communications, and stand-in components, such as the Unmanned Combat Air Vehicle (UCAV), the Miniature Air-launched Decoy (MALD) and MALD-J, were to provide the Air Force with the capabilities to disrupt IADS connectivity and integration, allowing penetrating aircraft air superiority. “A service that enters the battlespace without jamming capability is one that will be dramatically constricted as to what it can do,” said Rep. Mark Kirk (R-Ill.), a member of the Appropriation Committee and co-chair of the House Electronic Warfare Working Group. But whether the Air Force intends to come up with an alternative to the B-52 standoff jammer is the subject of some disagreement. “The requirement for a Stand-off Jamming capability is still valid,“ the Air Force official said, “and the Air Force is actively evaluating all options to fulfill this capability.“ But whether such studies will necessarily result in a renewed Air Force standoff jammer program is a matter of disagreement. 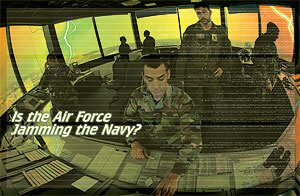 “The Air Force has done an electronic warfare study every year for the last forty years,” said Air Force Lieutenant. General (ret.) Lanny Trapp, now a consultant at Burdeshaw Associates Ltd., a defense consulting firm in Bethesda, Md. “But the fact is they just cancelled a big program. But Nolan Schmidt, director of Airborne Electronic Attack Initiatives at BAE Systems in Lansdale, Pa., believes the Air Force is likely on a quest to find lower-cost alternatives to the B-52. BAE had teamed with Boeing to compete for the now-cancelled standoff jammer program. “It doesn’t look like they’re just going to drop this by the wayside,” he said. Rather, according to Nolan, the Air Force is seriously considering a scaled-down B-52 system, as well as F-15e, and UAV-based systems with lesser capabilities. One idea that is gaining traction, in the nature of an interim solution, according to Schmidt, would involve a modification of the originally contemplated B-52 standoff jammer. The B-52 SOJ, as it was originally configured, gave off a great deal of radio frequency and radiated power, he says. The thought, in developing an alternative interim solution, is that the Air Force could meet its requirement with lesser capabilities. The Air Force is also looking at systems that would be based on the F-15e or on an unmanned air vehicle platform, according to Schmidt. The F-15e alternative would adapt the Navy’s jamming capabilities from the EA-18 Growler and fit it to the F-15e platform. The UAV alternatives that are being considered “probably won’t match the requirements capabilities,” he said. “What needs to happen is a good healthy amount of modeling and simulation analyses of what the requirements actually are and what each alternative can do relative to fulfilling those.” An ultimate decision will revolve to a large degree around budgetary requirements and Schmidt believes that some Air Force budget dollars could be freed up for electronic warfare around 2010. All the Air Force will say is that it is “evaluating all options against the classified SOJ requirement document validated by the Joint Requirements Oversight Council, as well as against fiscal realities. We are examining, along with the joint community and OSD, a number of risk mitigation options,” said the Air Force official. If Trapp is correct, the Navy will have to continue to shoulder the military’s Airborne Electronic Attack mission for the foreseeable future, according to Chaisson. “The Air Force is not in a position to do anything in the near term because of the termination of the B-52 SOJ,” he said. “It’s possible some components of the EA-6B Prowlers and the EA-18 Growler could be tailored to an Air Force aircraft but that will take time. Something would have to be done this year to get the Air Force back into the standoff jamming business. Otherwise, they’ll have to give the whole thing to the Navy. “Either way it’s a mess,” he added, “because you must make sure the Navy has the capabilities.” At issue is the fact that the EA-6B Prowler fleet is aging while the EA-18 Growler has yet to be deployed. For Kirk, the current situation encompasses important strategic considerations. “Wewant to make sure we are planning so that a future secretary of defense or a future president are not dramatically constrained because the Air Force has decided to get out of the electronic warfare game,” he said.